The popularity of the Bluetooth technology is beyond words that it’s almost impossible right now to find a smartphone or mobile device that doesn’t have access to it. Commonly, it is used as a form of wireless communication in between mobile phones and gadgets like hands-free headsets, tablets, and laptops. Now, it can also be used for OBD2 Bluetooth scanner. For several years now, Bluetooth connectivity has also become a must-have in car technology as several laws have been put in place to make driving more safe and secure. A Bluetooth kit does not only allow drivers to speak hands-free over the phone, but it also allows them to listen to music through their compatible car stereo systems. In this article, we will focus on the use of the Bluetooth technology in car diagnostics. 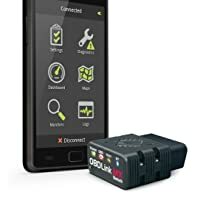 We will likewise feature some of the most sought-after Bluetooth On-board Diagnostics II (OBD2) scan tools available today and draw attention to their most important features. How do most Bluetooth scanners work? It’s simple. Who should consider buying Bluetooth scanners? Which vehicles do Bluetooth scanners work with? As we all know, the use of scan tools to diagnose possible issues causing a “Check Engine” light is extremely necessary. Thanks to the wide collection of sensors installed in vehicles nowadays, we’re now able to detect car engine, emission, and transmission problems using OBD scanners. Over the years, OBD 2 scan tools have also become increasingly powerful as more features have been added. Most notable is the use of the Bluetooth technology. Compatibility with most devices means convenience. Bluetooth auto scan tools can easily communicate with Android smartphones, iOS devices, and Windows computers. This means more convenience to drivers who want to easily get information about their cars minus the hassle brought by some wires. Portability and fast delivery of data are the norm. Bluetooth scanners nowadays have a compact size and have been integrated with features perfect for users who are always on-the-go. Moreover, data processing is ultra-fast that users can even view real-time car data in no time. 1) Additional software or app is first installed on the smartphone or computer. Most of the time, the software is provided with the Bluetooth adaptor. For more information about the availability of the software, users may check with the manufacturer. (Note: Some OBD2 scanners may only work in an Android smartphone, while some are designed solely for iOS devices). 2) While the ignition switch is still turned off, the Bluetooth scanner is plugged into Diagnostic Link Connector (DLC). 3) Without starting the vehicle, the ignition switch is turned on. The Bluetooth scan tool may then start scanning the car. 4) Once Bluetooth connectivity has already been established in between the Bluetooth scanner and the smartphone or laptop, users can begin viewing the results of the scan. Bluetooth automotive scan tools are highly-recommended to amateur and professional auto mechanics. For amateur auto mechanics, Bluetooth scanners can send out useful data like engine speed, temperature, and fuel economy. These can provide users a somewhat complex, but easy-to-understand view about their cars that can serve as guide when troubleshooting car problems. For professional auto mechanics, reading generic and original equipment manufacturer (OEM) trouble codes would be a lot faster. Bluetooth scanners likewise offer more features that would surely complement to every professional mechanic’s existing set of automotive tools and equipment. Compatibility with vehicles. Cars that have been manufactured and sold since 1996 are required to be OBD2-compliant. This means that if you’ve purchased a car just recently, the Bluetooth scanners available today are most likely to work. Still, it would be best to check your car’s make and model on the manufacturer’s site for more information or to contact the Bluetooth scan tool’s maker for further advice. Compatibility with devices. Most of the devices we have now are Bluetooth-compatible. However, it’s important to check if your smartphone or tablet can communicate with each other. Some auto scan tools are designed to work only with Android smartphones, while some work mainly with iOS devices. Meanwhile, there are some scan tools that can work with various operating systems. Features: Bluetooth scanners offer varying features that amateur or professional auto mechanics may either find helpful or unnecessary. It’s therefore advisable if you know what you really need from the scanner so you’ll know which to choose. If you’re fine with a device that simply reads and clear trouble codes, then you may settle for a cheaper, but reliable scanner with lesser features. 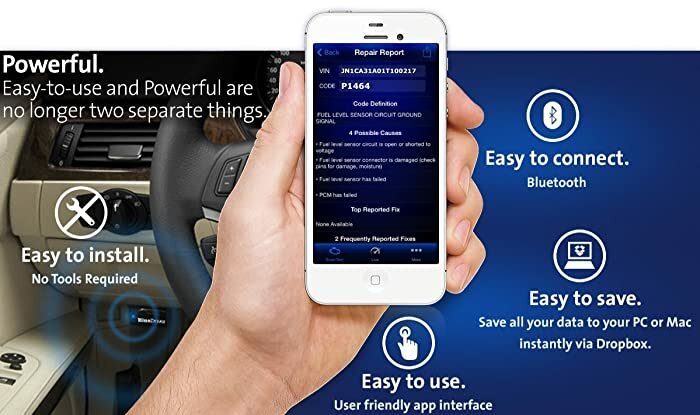 For professional auto mechanics, a Bluetooth scanner with loads of features may be the best choice. Price: Normally, products that offer more features are often more expensive. However, the more costly devices are not at all times the better ones. Other features offered are sometimes not too important, but are there for marketing purposes. It therefore pays to be smart when determining which product is the right one for you and your car. For more information about the OBD2-compliant vehicles, users may refer to this link. Lemur Vehicle Monitors did a good job of coming up with an excellent device like the BlueDriver Bluetooth Professional OBDII Scan Tool. Firstly, I should say that this is a much more improved auto scanning device. It is handy, inexpensive, and easy to use on either iOS and Android phones or tablets. If you know where the OBD2 port is, it shouldn’t take you too long to start using it. With the scan tool plugged into the OBD2 port, you pair it with the smartphone via Bluetooth. Seconds after, you may start using the BlueDriver app to scan and clear trouble codes. You can even view some possible causes of the trouble codes and their most popular fixes. Moreover, you can view various information like the RPM (Revolutions Per Minute) and email vehicle reports in PDF format. One of the most important features of BlueDriver scanner is the Smog Readiness Test. The smog check performs several tests that are also likely to be run through during official emission tests. This is especially helpful for those who own cars that need emission inspection. Meanwhile, the wireless connection has the tendency to drop. This can be a nuisance sometimes as you would never know when it happens. Although Lemur says this scan tool works on all OBD2 vehicles, this does not mean that it will show more data aside from the error codes. The information that this scan tool provides may be limited most especially if your car is old. Despite these, the advantages brought by this scanning device outweigh the disadvantages. 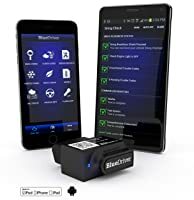 The BlueDriver Bluetooth Professional OBDII Scan Tool has a lot of useful information that could help amateur and professional mechanics easily address trouble codes. This is highly recommended to all OBD2 vehicle owners who are comfortable of fixing some car issues themselves. 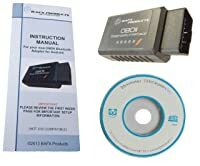 Like the other automotive scanning devices I’ve tried, the BAFX Products 34t5 Bluetooth OBDII Scan Tool is easy to setup and is straightforward to use with the help of the software/documentation CD that came along with it. For an easy-to-use scan tool that is compatible with Android devices via Bluetooth, the BAFX Products 34T5 is an excellent choice. I like the fact that the respective manufacturers of the Torque app and the scan tool have together come up with an instruction guide. This helps a new user to effortlessly pair his/her respective Android device with the scan tool. I’ve heard some people complain about a Trojan virus coming from the documentation CD, so I made sure to run a scan before opening its contents. So far, my scan results were fine and there were no malwares found. The BAFX Products 34t5 OBDII Scan Tool does blink a lot when it starts communicating with the Android phone through the Torque app. Pairing the phone and the scan tool is seamless, while maintaining Bluetooth connection is never a hassle. I used it along with my Samsung Android tablet and I enjoyed viewing several gauges on a single, bigger display. You’ll even like it more if you have Internet connection, because you will get more details about the trouble codes detected from your car. Meanwhile, the free app that needs to be installed to get the scan tool to work asks for some personal information like your location, caller info, and media files. This may be uncomfortable for most people who don’t like sharing any of their private data. I highly suggest the BAFX Products 34t5 Bluetooth OBDII Scan Tool to anybody interested of reading and clearing codes and/or monitoring performance. It’s a very inexpensive device, but is loaded with several features that car users would find helpful when diagnosing “check engine” light problems. The Autel MaxiScan MS300 scan tool is easy to setup for first time use. If you’ve owned a scan tool before, you can even get rid of the manual which was poorly written or translated to English. MaxiScan MS300 is capable of reading and clearing diagnostic trouble codes of most types from nearly any make and model. It operates in an intuitive manner with just two buttons. It’s powered by the DLC of the car, so users won’t have to worry about batteries. It only has two buttons, but both can be handily used to navigate some menus on a two-line backlit display. The Autel MaxiScan MS300 easily recognizes OBD2 protocols. Once it detects the proper protocol of a car, it displays whatever diagnostic trouble codes held by the car computer’s memory. So far, I’ve effectively used the scan tool to reset check engine light problems. It’s likewise very effective when it comes to fixing simple problems like dirty mass airflow (MAF) sensor, loose gas cap, bad spark plugs, and more. Personally, I suggest taking down notes of the code that this Autel MaxiScan MS300 scan tool generates. Often, you can quickly get answers by Googling the code or by visiting vehicle forums. Meanwhile, it’s important to note that this scan tool doesn’t do live monitoring and doesn’t perform online updates. Moreover, it doesn’t include printing capabilities. Note: The Autel MaxiScan MS300 CAN Diagnostic Scan Tool is not a Bluetooth scanner, but is included in the list due to customers’ overwhelming support. The Autel MaxiScan MS300 diagnostic scan tool is an effective device when it comes to determining certain kinds of car problems. The scan tool can serve as a guide on whether or not you can fix an issue by yourself. Although limited in features, I still would recommend Autel MaxiScan MS300 to car owners or technicians who are looking for an inexpensive, yet effective auto scan tool. The ScanTool 426101 diagnostic scanner is a small, but powerful device. By the look itself, it’s made of quality and durable materials, thus I can expect it to last longer. ScanTool 426101 OBDLink MX Bluetooth technology enables you to use your smart phone and PC as a part of your diagnostic tool. It works with any car or light truck made after 1996 and provides diagnostic data 4 times faster than its similar competitors in the market. Having used a few similar wireless adapters like the ELM327, the ScanTool 426101 scan tool is way faster and more reliable in terms of establishing Bluetooth connection and performing app updates. I never had any issues, whatsoever, with the wireless connection using my Samsung and Motorola phones. Its response time is likewise quick and it’s capable of supporting large amount of car data. This is great for those who want to quickly get vehicle information or clear annoying check engine light problems. Along with Torque Pro, the adapter works great as it’s capable of handling high-data speed. For about $5, you’ll get to see other nice interfaces and gauge dashboards that display information like the voltage, oil pressure, and manifold pressure. However, I’ve discovered some compatibility issues using the scan tool along with other car apps like DashCommand and OBD Auto Doctor. Other than the price, this is by far my biggest complaint about the product. One of my favorite features of the ScanTool 426101 diagnostic scanner is the Auto-Shutoff. I can leave it plugged into to the car 24/7 without having to worry about a dead car battery the following day. The ScanTool 426101 diagnostic scanner is recommended to those looking for a device that can be used long-term. Albeit expensive, the scan tool addresses some quality issues imminent from cheaper devices. It can likewise be relied upon when it comes to accuracy of data. 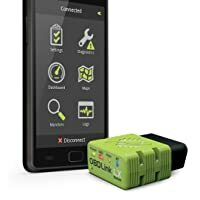 The ScanTool 427201 diagnostic tool, which is available in green and black, only uses the Bluetooth technology for its connection. It is very small at 1.8x2x0.9 inches and has an unsophisticated design, yet effective structure. If you are one of those who likes to know how things work, this will provide you with hours of entertainment as the information that it provides you is almost endless. It is easy to setup and is straightforward to use for the first time. So as long as you know where to locate the OBDII connector of your car, then you’re good to go. The device already comes along with an OBDLink Android app that is similar to other gauge apps like Torque and OBDwiz PC Software which cost about $5 and $30 respectively. The OBDLink Android app can be used to get real-time readings such as engine temperature, speed, fuel rate, and more. It can likewise detect check engine light problems and show pending error codes. A major selling point of this scan tool is that it can help determine if your car is capable of passing an emission test. For those who prefer using Torque Pro to enjoy the luxury of customizing gauges, ScanTool 427201 can be relied upon. Measurement of data such as throttle, vacuum, and torque is fast and accurate and there is no lag at all. If there’s one clear disadvantage that this device has, it’s the simple fact that it’s not compatible with iOS devices or computers. Meanwhile, I’ve read quite a few feedbacks from other users claiming their car engine shuts down everytime the ScanTool 427201 diagnostic device stops communicating with their phone or tablet. I haven’t personally experienced this problem, but it’s one of the things we can closely monitor for safety reasons. ScanTool 427201, along with the OBDLink LX, is an effective and highly-accurate device. It’s fast at retrieving information with almost no delay. I recommend this scan tool to all car enthusiasts. It’s important to note that all OBD2 scan tools we have today will only read OBD2 codes generated by vehicles, as obligated by law. Generic OBDII scan tools do not read OEM-specific codes that are separately generated from OBDII codes. Therefore, those having serious technical issues with OEM-specific codes would have to consult a certified mechanic or dealer who has the appropriate reader. Generic OBDII scan tools don’t usually allow resetting other diagnostic lights like the ABS brakes and airbag sensors. For this, an OEM-specific diagnostic tool would be necessary. The fact that there are now numerous scan tools for car enthusiasts to choose from, familiarity is a must to get the best diagnostic tool available. Bluetooth Scanners don’t just make car owners more knowledgeable, but also save themselves from hefty charges during visits to car shops. How To Choose The Best OBD2 Scanner Step By Step?